Carbon-neutral London home heating Nirvana with a buried milk tanker or three in the garden? It seems that ground-source heap-pump (GSHP) might not have a high enough CoP (Coefficient of Performance) to make our London home carbon-neutral or net-zero-site-energy over a year for space heating and domestic hot water (DHW). Following a fascinating discussion with Brian Mark of Fulcrum in late 2007, I decided to try to sketch the design of a system using an insulated year-round thermal store. (Also called an "(inter)seasonal thermal storage system".) It would be 'charged' with heat in the summer and 'emptied' in the winter, rather than continually pumping heat from the ground. 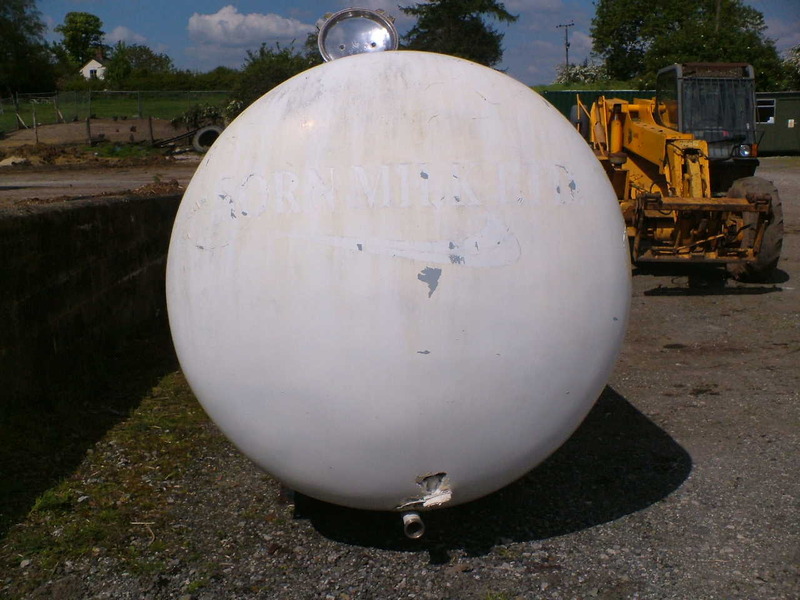 Bury a 20,000l-ish (ie 20m^3, 700cuft) second-hand stainless steel milk road tank (well insulated) and full of water (plus maybe corrosion inhibitors) in the garden. In the summer, energy from solar thermal panels is pumped in, and in the winter pumped out again for space heating and DHW, and much less energy is required to pump the energy this way. Indeed, any excess RE year round, such as the dump load for a wind-turbine or even solar PV, that would otherwise be discarded, could be captured in the thermal store. This is much more efficient then trying to generate and store energy as electricity, for example, when all that is needed is heat. I have to do the sums for the energy capacity vs our energy usage and so on, but this looks like an interesting alternative to GSHP. Milk is good for you! Assuming that the water in the thermal store neither freezes nor boils, and that a range of 10°C (mean ground temperature) to (say) 90°C (to avoid building up any vapour pressure) is possible, then our store can retain at most 80°C * 4.18J (heat capacity) per gram of water, ie ~334J/g. 20kl of water is approx 20Mg ie 20Mega-grams (and about 10% of our house's heated volume as it happens), and thus our store has a capacity of maybe 6.7GJ (Giga-Joules). Note that to maximise the efficiency of the heat-pump we should probably try to keep the thermal store's temperature range as close as possible to the temperature that we want to get our house and/DHW to, to minimise the thermal gradient that the pump is working against. That temperature would be somewhere between (say) 30°C+ for underfloor heating up to 70°C for DHW. Keeping the thermal store too warm (too far above the underground mean ~11°C) will increase heat loss into the surrounding ground, though that surrounding ground might then actually become part of the store. But my initial guess is that keeping the thermal store temperature between (say) 10°C and 30°C might be best, though that range reduces the capacity to 25% compared to an 80°C range. Another way to increase overall efficiency might be to have the heat-pump heat water just enough that each day's new solar input (even mid-winter) is enough to bring water up to the (DHW) temperature required, minimising the thermal gradient that the heat-pump has to work against. Proper thermal stratification in the store(s) may help with this. When solar input has not been sufficient, which it won't be mid-winter, the heat-pump will have to overcome more of the temperature gradient itself, resulting in a lower CoP. We don't need any significant space heating for about half the year (we do use about 10kWh/day for DHW year-round though). We use a mean of maybe 20kWh/day for space heating for six months of the year, so, roughly, 180days * 20kWh/day = 3.6MWh = ~13GJ for winter space heating. Our 2007 space-heating and DHW energy consumption was ~26GJ. To cover DHW in the six months 'winter' period would require a third tanker! How do we put energy into the thermal store renewably? RE doesn't just stop in the winter in the UK. Assume the bulk of the energy is to be collected with solar thermal panels unshaded, south-facing, at a fixed angle of ~36° to the horizontal. In London, mean insolation per square metre year round would be ~3.1kWh/day (see PVGIS), maybe 4.8kW/day/m^2 in July down to 0.89kWh/day/m^2 in December. Insolation of about 2/3rds of that is available with panels at 90° (ie vertical, eg on a wall), but with more of the output in mid-winter, peaking at 2.8kWh/day/m^2 in August and down to 0.95kW/day/m^2 in December. At ~50%-efficient energy capture and the ~36° incline, (and assuming that we could use solar PV to drive any pumps, etc, needed) given that our year-round load averages 20kWh/day we'd need 13m^2 of panels. Probably not impossible since our (horizontal) roof area is ~40m^2, even though it is half east-facing and half west-facing and is not entirely unshaded. Vertical (or near-vertical) collection panels to minimise summer energy absorption cf winter. An overhang can help protect against overheating in high summer sun. A 'fail-safe' drain-back system to empty the collectors when the system is 'full' eg the tank is over ~80°C (and in very cold weather to prevent freezing). This could partially filled, not just all-or-nothing. A heat sink (disipation) system, eg reverse heat pump into ground or drain/greywater, or a heated outdoor pool, or an oversize/seasonal thermal store. Thus the tank/store is worthwhile if its capital and running costs are less than the extra capture area otherwise needed. And clearly, this need not be 'all or nothing': 3 months' storage rather than 6 months' might still reduce the necessary solar thermal panel capture area significantly, though I've not yet attempted to compute the trade-off numerically. One big advantage of solar PV over solar thermal is that 'excess' energy can simply and safely be ignored, ie not used, without any damage being done. Although PV is much less efficient than thermal at capturing energy, in theory coupling it with a heat-pump can recoup a lot of the difference (it might be just possible to have 20% efficient PVs and a heat-pump CoP of 5). In principle any excess can be sold (or given!) back to the grid, which while not currently financially very rewarding, does displace some CO2 generation elsewhere. It would be useful to have an energy store (an oversize hot-water tank) in the house to cover a day or more of DHW and heating demand. A (tall, stratifiable) tank such as the TORRENT 450 'RE' (450l) if allowed to vary between (say) 60°C and 95°C can store ~70MJ which is somewhat less than our peak 30kWh/100MJ peak daily winter demand so probably represents a minimum usable size and would mean little scope for my favoured morning hot bath! The Solus II 2200L (2200l) might store ~90kWh/320MJ which would maximise the chance of using a heat-pump efficiently to warm the water and solar thermal being able to top it up to (higher than) DHW temperature even mid-winter. The Solus documentation even describes paralleling two tanks if necessary. A TiSun PC5000 holds 4950l which might store a week's worth of heat. Water should be stored at over 60°C to kill bacteria such as Legionella, but water this hot represents a scalding risk and should be distributed at or below 50°C: regulation of storage/outlet temperatures is important for health and safety. Heat can be pumped into the house store from our seasonal store as needed, for example when we have available solar PV so as to minimise grid energy draw, and the house store will ensure that there is hot water available all day/night even though the solar PV is clearly only available for a small part of the day, especially in winter. 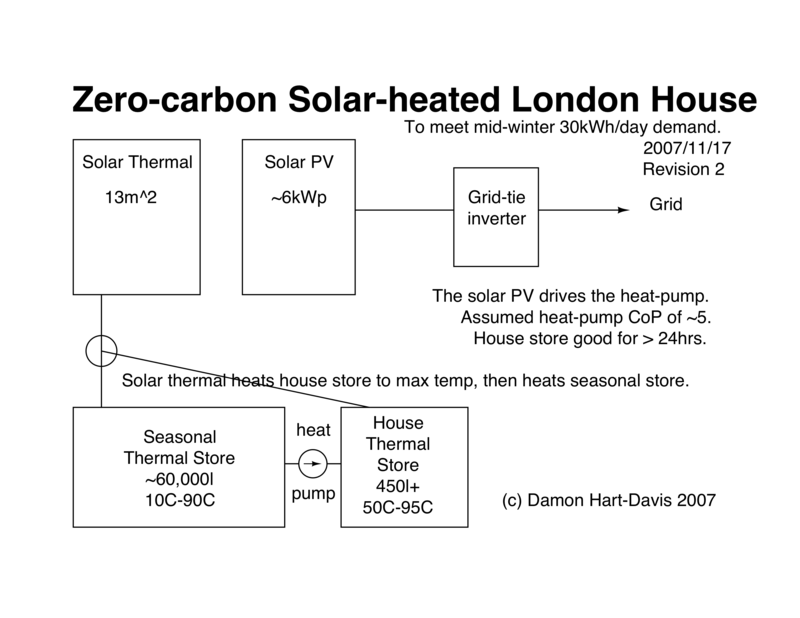 A larger in-house thermal store would ensure that more hot water and heating would be available on a cold winter morning before the sun came up, and if expanded to cover several days, eg maybe to a 2kl/2m^3 store, would allow the system to ride out several cloudy days (ie where little solar PV is available to run the heat-pump) without needing to draw grid power to run the heat-pump. If not enough solar PV is going to be available to cover heat-pump use (in addition to other electrical loads driven from the same PV panels) then off-peak or 'green'/renewable electricity could be purchased, and/or the heat-pump could be kept off during grid peak load where more carbon-intensive fuels are being burnt, ie ~4pm to ~8pm in the UK, to minimise the CO2 contribution from running it. The toughest strain on the system is mid-winter when there is least insolation. In England on average in mid-winter 1kWp of solar PV should produce about 1kWh of energy. If the heat-pump from our thermal store has an overall CoP of ~5 which seems plausible given that our store should be well above the 11°C ground temperature, ie closer to our house-store/DHW temperature, then to support 30kWh/day heat demand mid-winter we'd need ~6kWh/day of PV, from ~6kWp of panels, on top of covering other loads. In general it would probably be best to have the solar thermal panels heat the house store directly until it is at its maximum temperature (which is probably ~20% of total demand on a mid-winter day), and then divert it to heat the seasonal store (eg mainly in the summer). This pumping can be driven directly by solar PV if need be. If the heat-pump can be operated directly from solar PV when the grid is down then the house store can be kept topped up indefinitely, and thus the heating remains available indefinitely. This is more robust than a typical gas combi boiler which will stop if either gas or grid electricity is unavailable. An engineer from a UK solar-thermal systems supplier kindly humoured me with some outline component costs while pointing out that this is not the same as full install costs for a well engineered and reliable system that he'd be prepared to build or install! He suggested that 13m^2 of evacuated tube solar hot water might cost something under £9k (November 2007). For a small house the bulk of the replumbing (etc) might be in the region of £2k-£3k, excluding any of the complications of heat-pump interaction with a huge thermal store as proposed above. The TORRENT 450 'RE' (T450RE) house thermal store is listed at ~£2400 as of Nov 2007. For reference, our current CH/DHW is provided by a "Potterton Performa 24" 'instant' mains gas combi boiler rated at 24kW, corresponding to a DHW flow of 9.8l/min raised through 35°C. The manufacturer tells me that this cannot be used to heat DHW fully or partly 'pre-heated' in a house thermal store by solar/GSHP. Whether 'standard' heat-pump units should/could be used to transfer energy to and from the thermal store. What CoP might be reasonable to expect: I has to be much better than 3 or 4 round-trip to make this scheme better than 'conventional' GSHP. An ATES system in London achieves a heating CoP of 5. Doing everything to improve insulation first, ie reduce the need for heating, is likely to be by far the best thing to do in terms of cost and CO2 savings. Eg, 350mm+ in loft space. Rather than buring a tank outside, a cellar of 60m^3+ capacity could contain the store. Recover drainwater/greywater/graywater/sullage heat overnight, and/or to prewarm incoming water for heating and/or heat-exchanged with or heat-pumped to the lowest levels of the house or seasonal thermal stores. Possibly 70% of heat could be usefully recovered from (say) bath/shower waste. Bury the (top of the) storage tanks more than about 6m deep (since the temperature gradient moves about 1m/month) and let the surrounding soil add to the thermal mass of the store providing that there is nothing to carry excess heat away such as moving groundwater. Keep the water in the seasonal and house stores thermally stratified. Spread the thermal store over several separate tanks, both for engineering robustness in case one springs a leak or whatever, and also to potentially keep one for space heating nearer 30°C and for DHW nearer 60°C to reduce the thermal gradients that the heat-pumps have to work against to improve efficiency. That would mean added complexity, and possibly needing two heat pumps, so might not be worthwhile. Maybe use rainwater run-off to fill the tanks rather than potable mains water. Possibly as much as 3.5kWh/day of our DHW energy demand is my morning hot bath (40°C water temperature rise (~10°C main to ~50°C bath) times 75l water (150l capacity half full of me) times 4.2kJ/l = ~13MJ = ~3.5kWh). If I dodged the soap every other day or showered some of the time (neither of which helps my aches as much as a bath), then we could trim our demand a little. Shifting bathtime to the evening might help me use 'residual' heat a little better, without the noticable heat/temperature loss from a smaller house tank/store through the night. Driving underfloor heating from lower down a stratified house store/tank at (say) 30°C might be more efficient than normal high-temperature radiators competing with DHW for the hottest water at the top of the tank. As suggested by Ungrounded Lightning Rod at OtherPower/Fieldlines, for better value possibly I should use glazed and vacuum/evacuated tubes in series to maximise bang-per-buck: "glazed first to get the temperature up cheaply, then vacuum to really peak up the temperature just before the water goes into storage." Suppose I ignore my normal outrage about electric resistance heating and [wasted] exergy, which does not [fully] apply if I can (say) get my magnetite to ~1400°C where it or the nichrome wire I'm heating it with melts, and I want to seasonally store PV output from summer until I need heat in winter. What volume (never might the weight for now) would I need to cover my space heating? Indeed I'll do my DHW ("flash to steam, baby") also and get rid of gas, for simplicity. Last year we used 3MWh of gas, ie ~1E10J, for space and water heating. So at 3893104J/K.m^3 and (say) at least a 1000°C temperature delta that gives me 3.9E9J/m^3 or somewhat under 3m^3 of magnetite to hold the energy for a seasonal store. Somewhat less of a size issue than a buried water-filled milk tanker or three on my small plot, but ripe with its own health-and-safety issues. And we don't really have 3MWh of electricity to spare (we generated just under 4MWh last year and used about 1.7MWh as electricity) but not utterly implausible. Nominally with a heat pump the exported electricity would cover our low-grade heat requirements over the year. The density of magnetite is ~5t/m^3, so ~15t for the seasonal store. Adequate insulation would probably at least double the total volume, though possibly not the weight. This discussion merged into a storage thread on eBuild with Andrew Bissell, the CEO of Sunamp, explaining how its heat batteries work (for daily storage, eg SunampPV) and the possibilities for seasonal storage at 500kWh/m^3 with Thermochemical Materials (TCMs) that use reversible chemical reactions to store heat and can be held, charged, at room temperature to remove the need for vast insulation. See also re-thinking DHW with SunampPV. My wife and I are going to be building a new, well insulated house next year and we are considering installing quite a number of 'eco' (I hate the term) devices. Certainly, rainwater collection will be one of them, and I am looking at ways of reusing the bathwater. But I can see with bathwater, particularly during the winter, that there will be more water available than we can use. One idea I have is to adopt a 'Japanese' style of bathing. Shower and clean outside the bath and them get into the bath, full of hot water for a nice long soak. In Japan, the whole family will use this hot soaking tub of water and at the end of the bath time, it is virtually uncontaminated. In fact, in Japan, that water will be reheated and used for a few days before being discarded and refilled. Most Japanese bathrooms have a sort-of 'in-line' heater that takes the bath water, heats it up and returns it to the bath. The bath itself is usually filled with cold water. But trying to find such a heating device in England is proving very, very difficult. However, that is not why I started this mail. In one section, you mention about heat banks / thermal stores, such as the TORRENT 450 'RE' (450l). I have been looking into this as I would like to install a thermal store in our new house, It seems to me that there is a great difference between the UK manufacturers and European manufacturers. I don't know who is correct, but my feeling is that Europeans have greater experience in this field. UK seems to make small(ish) tanks with only 50mm of insulation as standard, then tell Joe Public how good they are and how quickly they recycle. Europeans seem to go with much larger tanks (800ltr/1000ltr) and have 100mm of insulation. Obviously, more insulation equals less heat loss. Have a look at http://www.tisun.com/cms/en/vertriebspartner-haendler/england-wales/ or http://www.martin-sandler.de/index.html (it is a German site but if you Google Martin Sandler and hit the Translate button!) Construction Resources sell this tank. Regarding GSHP, we have looked into them and decided not to install one, mainly on a cost/payback issue. We do not really have sufficient space for ground loops so the only alternative would be boreholes, which as you know, are horrendously expensive. However, I did find a lower price alternative to boreholes. This company (http://www.lankelma.co.uk/) are Dutch; they bang something like scaffold poles into the ground, drop the GSHP flow/return pipes into the tube, give the tube a twist to unscrew the pointed base, and extract the tube, leaving the ground to encase the flow/return pipes. They apparently usually go 25-30 metres deep, so 4 x 25m deep holes would give a total pipe length of 200m in a very compact space with minimal disruption to the garden. I believe they are not as expensive as normal boreholes but certainly much faster. Yes, the fact that a 450l tank is the biggest that I have yet been able to find being marketed in the UK is not great. My feeling is that In any case I'd want at least double that or more to carry several days' heat especially in winter when there are often several overcast days in a row. Also, the appropriate British Standard still allows over 2kWh/day of heat to escape from a ~250l tank, which seems too high for modern designs. I could not find what the TORRENT 450 tank loss was specified as: did you run across a number from them? PS. I've just run across consolar.co.uk who have (a) a very sensible sizing guide amongst other things and (b) stores up to 2200l. Thanks for the Consolar link, I was looking for it. Every manufacturer has a different system and how to find (and buy the best/most efficient) is very difficult. I happen to like the Tisun solar heating system, but I have no logical reason; likewise, the Consolar seems to use a similar solar heating system, stratifying the water. 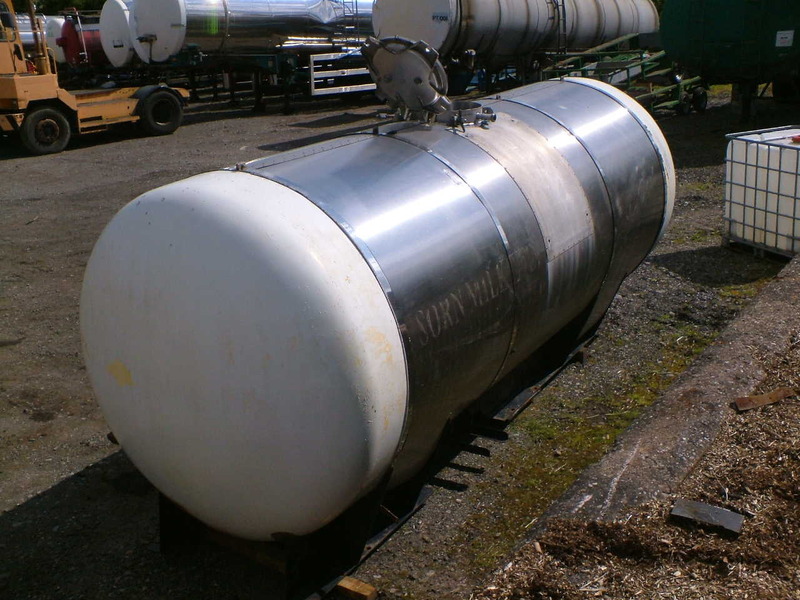 One UK company that seems to be popular is DPS, but they don't make large or well insulated tanks. 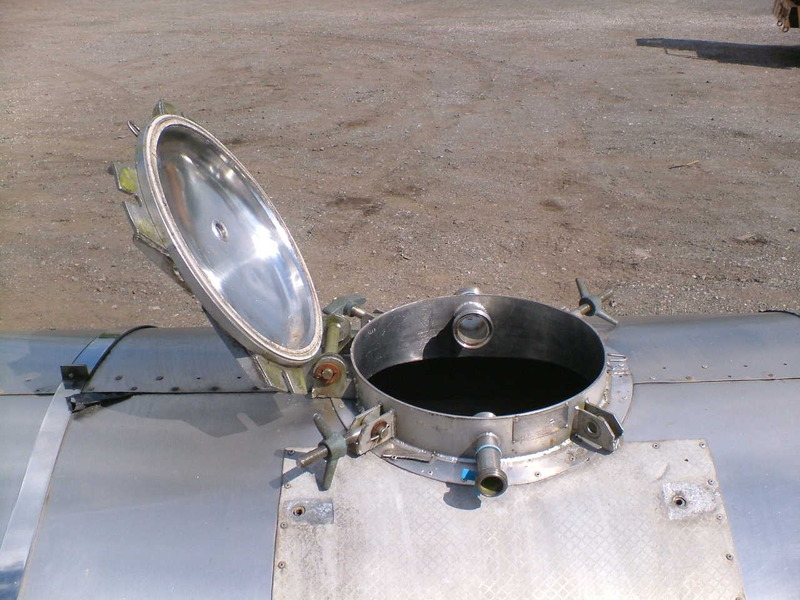 However, they do use an external plate heat exchanger to heat the DHW. What are the benefits over having a coil within the thermal store? Beats me. They state that the heat exchanger can be easily replaced but why should it need to be? Guess you pays your money and makes your choice! You are obviously familiar with the Japanese bathing method. My parents-in-law now only fill their bath about twice a week, heating it every evening and topping up as necessary. Shower, soap and scrub outside the tub, climb in for a nice submersed soak. It's great. There are soaking tubs available but they are just a different shaped bath. The best I have found is actually Australian (http://www.japanesebath.com.au/) and not so outrageously priced. I did e-mail them about the Japanese style of bath water heating but their response was that it was unhygienic and therefore dangerous to the health. Yeah, 150 million Japanese find it unhealthy too! I have even thought about getting a Japanese heating unit next time we are there but I can foresee all kinds of connection problems, let alone a CORGI man taking a deep intake of breath and deeming it dangerous. My parents-in-law have their heater on the outside wall, adjacent to the bathroom. No larger than a desktop computer; the controller is in the bathroom. Hit the on button to fire it up, set the timer and away you go. Water flow is by convection, no pumps involved. Just an inlet and outlet into the bath. If I could get something like this at a reasonable cost, I would also insulate the bath, which is something one never sees. Don't think Japanese baths are insulated but after the bath, one covers the water with a top (sometimes floating) and usually the next evening, the water still has a bit of residual warmth. I have even investigated Jacuzzi in-line heaters but they don't seem to provide sufficient heat to get a bath up to soaking temp in 15/20 minutes, which is the time my parents'-in-law takes. But then, a Jacuzzi heater is designed to handle a lot more water and not to get to bathing temps. Regarding reclaiming the heat from a bath, I have also looked into it a little and found this gadget; these links; http://www.gfxtechnology.com/index.html, http://www.lowheat.iphe.org.uk/ (but I don't think anything exists yet; also see http://www.eurekamagazine.co.uk/article/9915/Keeping-in-the-heat.aspx) but I'm not sure how this kind of heat recovery works. After all, the waste heat from the bath, although considerable, will be cooler than water in the thermal store, so I guess there would have to be another heat exchange unit, low on the store, similar to the solar exchanger. Probably not really worth it. Can't afford my next idea, but a very large buried collection tank in the garden to collect warm waste water could have collector coils for the heat pump to extract the warmth. But what happens when the heat has been removed? For grey water, there is this toy (http://h2oplc.com/grey_water.htm) from Germany I think, but it is probably more complex and expensive than necessary. If we can use the Japanese system, have a diverter on the bath outflow, almost clean water could be sent to a holding tank for reuse or directed to the the sewerage system when the holding tank is full. But as I said previously, if that water is used for toilet flushing, there will almost certainly be more than we can use so would still have quite a lot of wastage. I think that most thermal stores will benefit from stratification so you get hotter water than you really deserve for the energy put in! I saw the GFX thing, thanks, and one of us does take showers, so that might cover some of our usage. The bath is more problematical since the cold water for heating for the bath is not being drawn when the warm water goes down the drain, of course, and also, as you said, it's not obvious that it will be warmer than much or any of the store. My current thought is either to use it to heat the seasonal thermal store if possible, or to use the heat pump to quickly pump its heat into the house store if possible, or to use it to take the chill off a holding tank of incoming mains water destined for the DHW system (but not getting it warm enough to allow bugs to breed in the chlorinated water). Dunno. I hope to have a chat with a Man Who Really Knows [who advises the UK government]. As to cleaning the greywater enough to use in WC cisterns and stuff: that does seem like quite hard work and think it is more suited to a place where water itself is scarce, which is not (yet, often) the UK. I have a friend in Malta who uses a well in his garden (which may or may not be potable) for WCs and for cooling/heating with a heat pump AFAIK. They really do have a horrible shortage of water, with much of it being desalinated seawater using expensive electricity from inefficient oil-burning generators. I think that the UK authorities don't want greywater to sit around untreated anywhere to breed bugs, so any reasonable solution will involve its quick exit to the sewer (with minimal obstructions to prevent gumming up with the detritus, soap, hair, etc) one way or another I suspect. Off the shelf tools from Phase Change Material Products Limited for a variety of applications. The Beaufort Court development uses a seasonal thermal store. 2013/05/06: Thermochemical process for seasonal storage of solar energy: characterization and modeling of a high-density reactive bed. "Promising results have been reached: energy densities about 430--460kWh.m^-3 and specific powers between 1.93 and 2.88W.kg^-1 of salt." See SolarHome, suppliers of solar heating and DHW systems in the UK. SolarHome's site lists the following handy conversions: 1kWh = 3.6MJ = 3412Btu = 0.03412Therms. The NBS Building Regulations site mentions Solar Domestic Hot Water (SHDW): for a single typical house, for instance, a suitable water heating system would occupy 2.5--4m^2 of roof space. The cost would be £1,500--£5,000 for a flat plate system that will provide around 50% of the typical hot water demand, and up to £5,000 for an evacuated tube system that will provide around 60%. TiSun offers stratified thermal stores up to ~5000l. William Starkey of David Starkey Limited Road Tanker Sales & Hire wrote to me 2008/05/16 to tell me that it sells tanks, including milk-tanker tanks. "The smallest milk tank fitted to a milk lorry produced is 9000 litres [5.1m long x 1.8m wide x approx 2m high], which cost between £2750 - £3500.00. These would all come insulated. Alternatively IBCs are available (1000 litre plastic square containers, fixed in a cage, on a pallet) retail £40.00 each!" See tank pictures c/o Mr Starkey 1 2 3. See Perry Process for process technology such as second-hand stainless-steel tanks. The GFX-STAR 'batch' greywater heat recovery (from baths, dishwashers, etc) claimed to be easy to couple to an existing solar thermal system, ie with thermal store. The UK's Ground Source Heat Pump Association information c/o the National Energy Foundation. US epartment of Energy's Pacific Northwest National Laboratory Gray Water (Greywater) recovery code notes and conservation strategies allowed by the International Plumbing Code (IPC) Appendix C. Simply using this warm water to flush toilets, etc, may help retain the heat in the house as well as reducing potable water demand from the mains. However, key requirements of the code are that the greywater must be disinfected, dyed to differentiate it from potable water, and may not be stored for longer than 72 hours. In general, kitchen sink and dishwasher discharge, as well as toilet discharge, should be avoided. Discussion at Fieldlines/OtherPower about greywater heat recovery. The EST's Best Practice House guides. See the 'BedZED' (Beddington Zero Energy Development) in London. Recent discussion at the (UK) Green Building Forum. The UK's first Aquifer Thermal Energy Storage (ATES) system is going "beyond ground source heat pumps" in West London, by pumping heat in to the bores from cooling the building, not always just extracting heat. A heating CoP of 5 is quoted. Using greenhouse sub-soil as a local thermal store: Subterranean Heating and Cooling System (SHCS). The UK's Thermostatic Mixing Valve Manufacturers' Association (TMVA) site. The Green Power Talk site discusses various aspects of RE and microgeneration. British-Standard (BS 1566:2002?) ratings for maximum heat loss from insulated hot-water cylinders: BS7 (102l) 1.84kWh/day, BS8 (144l) 2.05kWh/day, BS9E (210l) 2.56kWh/day. C/o The Electric Heating and Ventilation Association in the UK, "DOM 9: Guide to the Design of Electric Water Heating System". A Solus II 2200l would lose 4.5W/K, ie ~7.7kWh/day with 90°C water and 19°C ambient air, though typically less because a lower storage temperature is more common. Something "grid-interactive" like SMA's Sunny Backup-System can provide the benefits of on-grid (for safe export of excess) and off-grid (the lights, fridge, etc stay on if the grid goes down) PV systems. In particular, a heating system such as a gas combi and/or heat-pump could keep running whereas normally they'd stop in the absence of grid power, keeping the house warm. First published 2007-11-14 , updated 2019-04-22 . Site copyright © 2007-2019 Damon Hart-Davis. Hosted by ExNet.